I guess we all didn’t like veggies when we were kids 🙂 kids mostly love fruits and so was I, because fruits are sweet and veggies are not. But, despite our childhood preferences my today’s post is about vegetable soup which I could probably like many years back if I would tried it before. My today’s soup is light, smooth and simply delicious. When I made it first time and tried, it was love from the first spoon. 😀 In Russia soup has another look (like Schi I posted about earlier), but creamy soup have different consistency and taste. 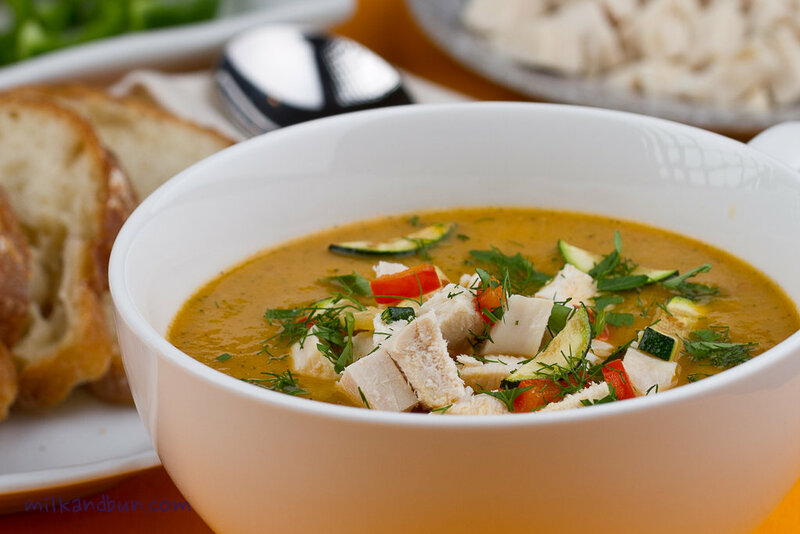 Needless to say, that soup with fresh veggies and plenty of protein in chicken breast are always a healthy choice for a general well-being and also for those who look after their body shape. 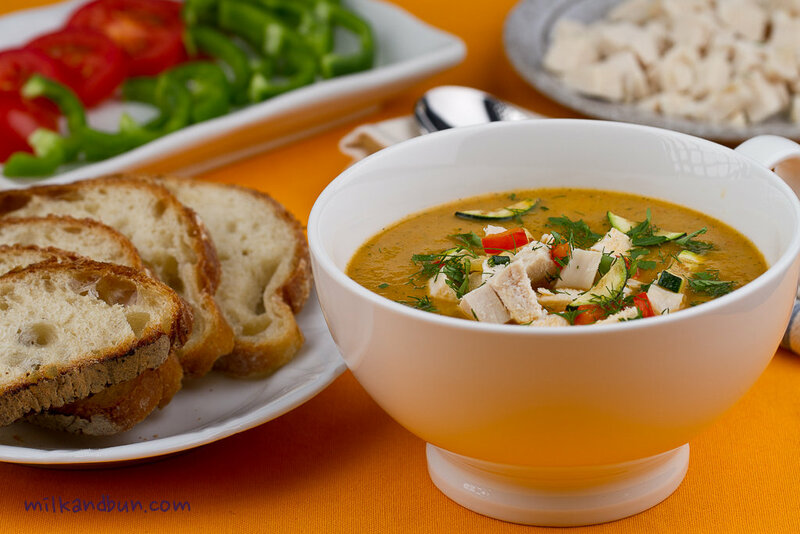 If you make this soup with raw chicken breast follow next step, otherwise go to the step 3. First of all, put the chicken breasts into a pan and cover with water (1l/34oz or so). Add bay leave, whole small onion and several peppercorns; bring to boil, simmer for 20 minutes or until the breasts are ready. Discard herbs and onion. Take the chicken out, cool it, then cut into small cubes and set aside. Reserve the stock. You can do it a day or two ahead. In a soup pot, heat the olive oil. Add the onion and cook until tender for 5 minutes. Cut bell peppers into cubes, add to the onion and saute for 4-5 minutes. Cut the zucchini into cubes, add to the veg-mixture and saute for 2 minutes more. Add chopped garlic, herbs* and chili pepper, stir and cook for 30 seconds more. Chop the tomatoes, add into the pot along with chicken stock (or water), season with salt and pepper and simmer for 10-15 minutes. Puree the soup until smooth. Put chicken cubes* into soup, bring it to a boil. Cover with a lid and simmer over moderate heat about 10 minutes. Ladle the soup into bowls, garnish with fresh dill or parsley and serve with baguette slices. *I recommend reserve some chicken and herbs for garnish. And now, would you like a dessert? Have a look here! Mar25March 25, 2014 • By milkandbun • This entry was posted in Healthy choice, Soups and tagged blog, chicken, cooking, food, food and recipes, food photo, food photography, healthy, healthy eating, photo, photography, recipe, recipes, Russian, soup, vegan, vegetables, veggies, zucchini. Bookmark the permalink. ← Eating out in Dubai. Pizza. Fabulous recipe! One of my fav winter soups! YUM! That looks delicious and sounds healthy! “Love from the first spoon”–fantastic!! I love vegetable soup, your soup looks light and sounds so delicious. I love pureed soups! I do love pureed soups too! Thank you! Great and healthy soup. This is what I need! Oh, that’s not weird! Do you like fruits now? 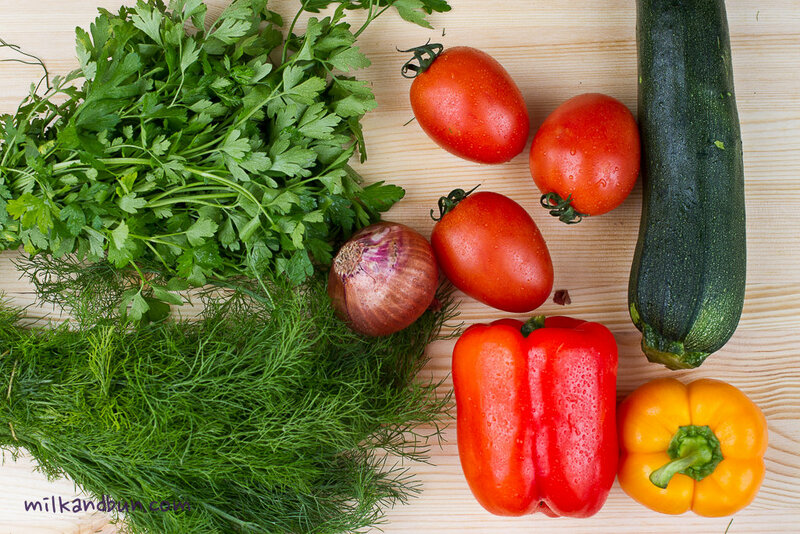 🙂 Even some adults don’t eat vegetables because it seems bland. This is indeed a beautiful flavorful soup. I love that you added chicken for additional protein and flavor!